Hello traders. Welcome to the News Trading Course and third module, News that move the market profitably enough for us to trade. 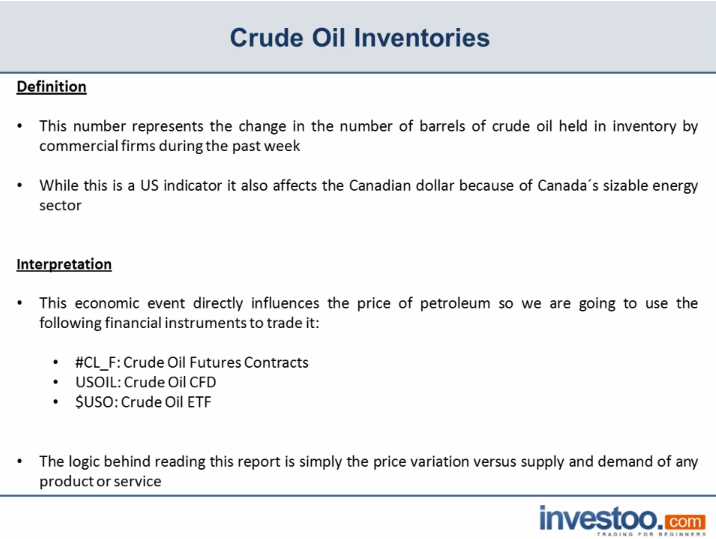 In this lesson we are going to learn about crude oil inventories. The cool thing about this economic event is that we are not going to use any currencies or any currency payers to trade it. But we are going to use either future CTS or CFDs. Now we are going to go through this later on in the course, but first of all lets start by defining what this release actually means. This number represents the change in the number of barrels of crude oil held in inventory by commercial firms during the past week. While this is an U.S. indicator, it also affects the Canadian dollar because of Canada’s sizable energy sector. What this means is we could actually use the luny to trade it, and of course the U.S. dollar, the Canadian dollar, currency payer to trade it, but we are going to focus on any instrument that follows WTI’s price. This means that we are only going to trade crude oil instruments with this economic event. Now, this is only the change in the crude oil reserves in the U.S. So we either have and increasing reserves or a decreasing reserves. That’s it. The economic event directly influences the price of petroleum. So we are going to use the following financial instruments to trade it — CLF, which is the Crude Oil Futures contract; U.S. oil that which is a crude oil CFD. For those of you who don’t trade crude oil or… Hey I’m sorry, that don’t trade futures contract, you can trade U.S. oil which is CFD or Contract For Difference. Or for those of you who trade in the New York Stock Exchange, you can trade shares of the crude oil ETF (USO). So there is an instrument for every trader out there. And the results after the release are the same. The logic behind reading this report is simply the price variation versus supply and demand of any product and service. This means that the more supply of a product there is in the market, the lower its price is going to be and vice versa. So when we get an increasing crude oil inventories, it means the supply of petroleum has increased while the demand remains the same. The immediate reaction is a decrease in oil prices. Okay? This is very logical because it simply states that if we have more product to offer, for the same demand of it, the price is going to decrease. And on the contrary, a decrease in the crude oil inventories means the supply has decreased making the product more scarce, thus spiking its price. So basically this is how you are going to read crude oil inventories, if we have a better than expected or a better than last month’s number, we are going to sell it, and a worse than last month’s number, we are going to buy it. So how are we going to trade it? Of course we are never going to front run crude oil inventories. Because crude oil inventories are very volatile event and it will bring a lot of volume in the market and you are going to see in the actual example of historic price action during the release that because of the volatility in the market during, well, moments before and during the release, we can’t even use pending orders. So we have to be careful and we are never going to use them. In fact, we are going to use key levels and corrections to get fields on our positions. You must remember this: we are always going to trade the side of the release. This means that if we get a better than last month’s number and we see a bullish move, we are not going to trade the bullish move because the release tells us we need to sell this instrument. So we are going to wait for a key level to appear and short any instrument we are watching.